The day has arrived to set the onion starts in the ground. We like to put them in while the weather is still cool; a hot day will wilt them so badly that we will have some loss. The onions are healthy this year. We seeded them early enough that they were able to grow to a good 1/8 inch plus in diameter. We trimmed them a week ago and as you can see from the picture how much they grew and actually strengthened in just a few days. Can you see the white scars on top where they were trimmed? They are strong and stiff when cut to half length; this keeps them from getting wind-whipped or even whipped by the plastic moving up and down. First we turn on the water of the t-tapes so that they will provide a wet area for transplanting. Also, this fills the tapes so that we can see where we will be planting. The swollen t-tape shows the row. Anytime we are transplanting a flat of starts, we flood the trays with water then the roots are not injured as we gently pull them out. Grasping a small handful, and gently pulling them out, then shaking the dirt loose in the watery mud. Aligning the onions in your hand, you trim the roots so that the bottom of an onion is not accidentally cut off. Trim the onion roots to 1/2 to 1 inch in length. Turn the onion around in your hand and cut off about half of the green top, to a length of 5 to 6 inches, depending on the diameter of the onion stem. If they are smaller, they will need to be cut shorter so that the stem is stiff. Otherwise, they will get wind-whipped or just plain “melt” or wilt in the sun. As you cut your handful of starts, you will store them in a bucket until you’re ready to plant them in the plastic mulch. We only cut as many starts as can be planted in about 15 minutes. Otherwise, the roots will dry out. Trimming the onion start makes a very nice, strong plant to poke down into the ground. It will stand up straight and tall in the plastic mulch and will not suffer much from the shock of transplanting. 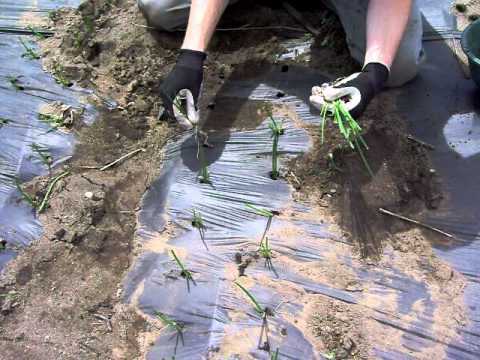 Using a pointed stick (we often use an old chisel), we poke holes in the plastic mulch 3 inches deep and 5 inches apart down each row (5 inches allows for the size of a large onion). The rows are set 4 inches from the drip tape, so that they get plenty of water. Running a row down each side puts the rows about 8 inches apart. After he pokes eight holes, he just sets a plant in each hole. He can then quickly tamp in the plants by pushing the soil firmly along each side of the plant. The water in the t-tape is on and will settle in the rest of the dirt. This is quick and makes it so that we can plant a large numbers of transplants in a short period of time. We will transplant around 5000 plants today. I will attach a couple of videos so that you can see this in motion. The wind was blowing and so makes it a little hard to hear. Happy transplanting! Thank you for the explicit instructions and the videos to show how you plant your onion plants through the plastic mulch. We plan to try this in our home garden this year as we have grown weary of battling the weeds in the onion patch. 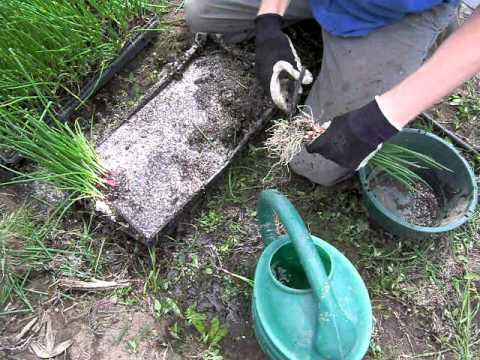 We are already veterans of using plastic mulch and using onion plants but have never found a clear and simple way to use them together. This year we started onions plants from seed and will try them along with some onion and leek plants that we ordered.